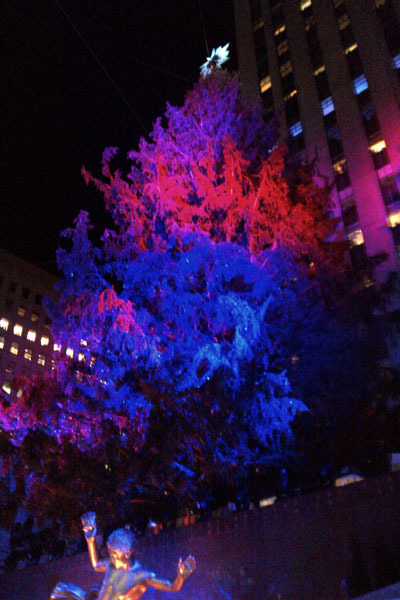 November 28, 2012 - The tree was lit at 8:55P. 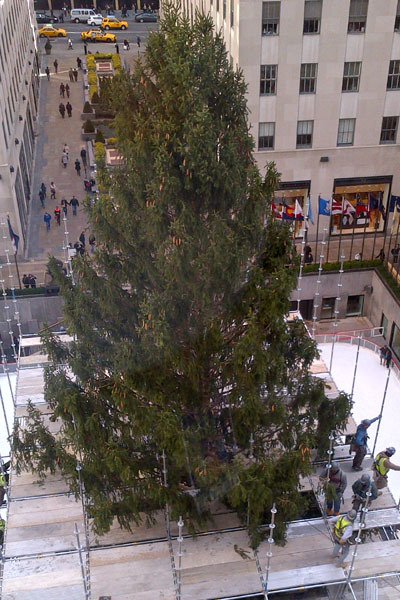 November 28, 2012 - The view from the Rockefeller Center Ice Rink moments before the tree was lit. 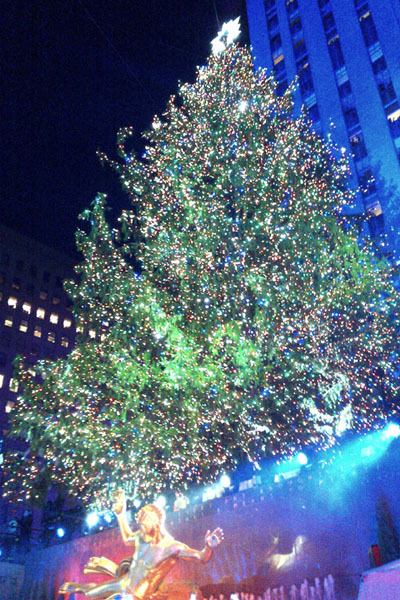 November 28, 2012 - WNBC's time lapse of the tree, setup through lighting. 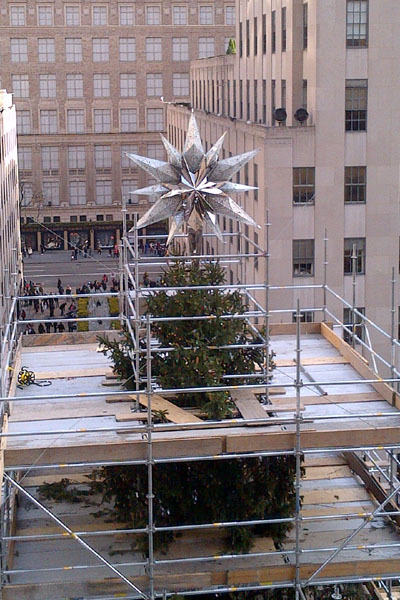 November 20, 2012 - Swarovski Star fully installed atop 2012 Rockefeller Center Christmas Tree outside WNBC's 7th floor window. 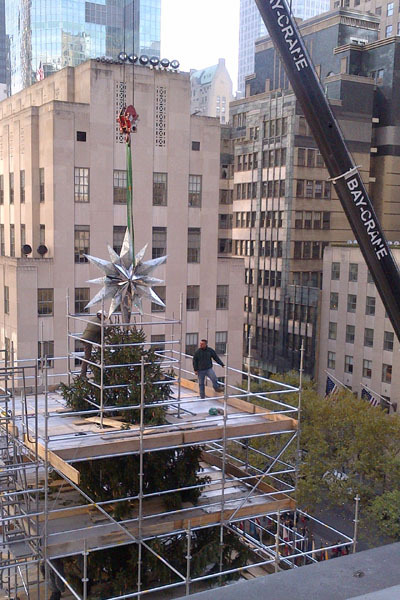 November 20, 2012 - Swarovski Star being attached to the tree. 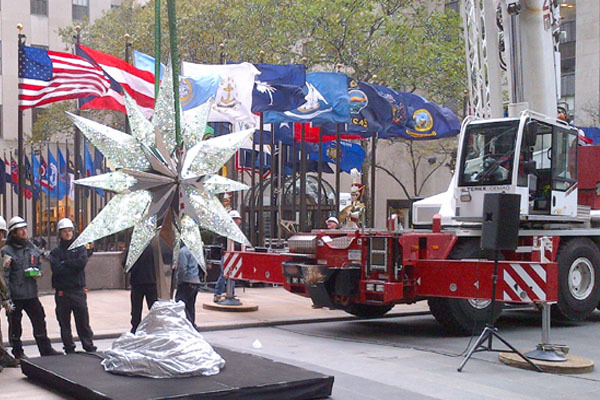 November 20, 2012 - Swarovski Star ready to be hoisted 7 floors to the top of the tree. 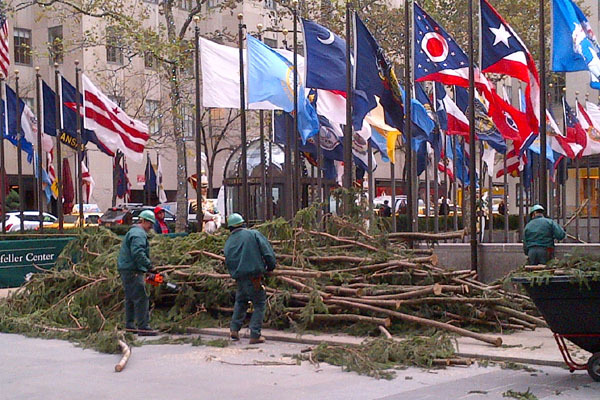 November 20, 2012 - Branches being prepped to be re-attached to the tree. November 16, 2012 - Material has been delivered for the branch-ectomy. 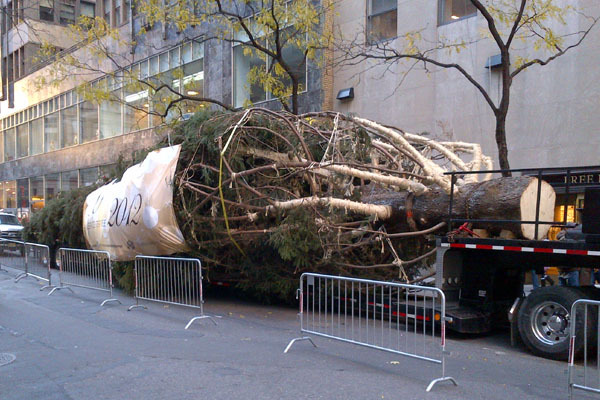 Branches are removed before the tree is shipped to Rockefeller Center and then replaced as part of the setup. 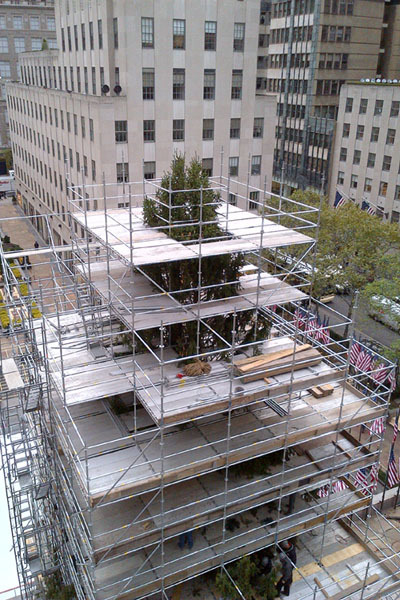 November 16, 2012 - Scaffolding complete. We should see the Swarovski Star put in place early next week. November 15, 2012 - Scaffolding almost complete. 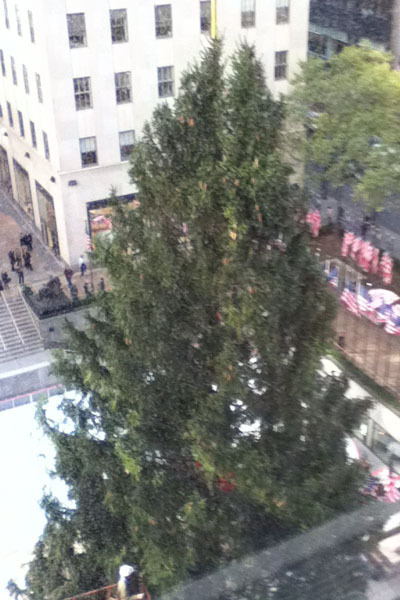 November 14, 2012 - Top of the tree from the 7th floor window at 30 Rock. November 14, 2012 - Parked on West 49th Street prior to delivery. 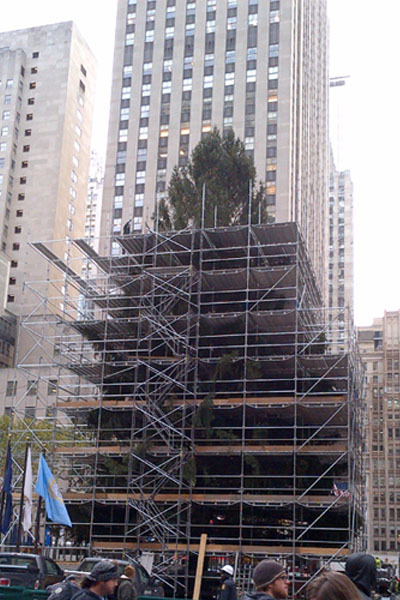 November 14, 2012 - This is probably the biggest Christmas tree stand in the world. 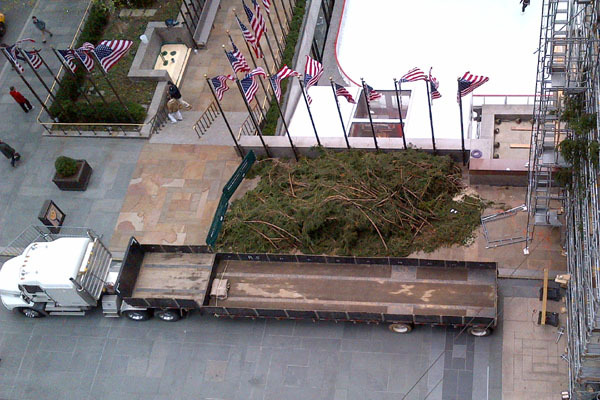 The tree arrives at Rockefeller Center today. September 19, 2012. Rockefeller Center Christmas Tree marker in the sidewalk ouside of 30 Rock. Click the image for a full resolution copy.